The lead pair of Gully Boy, Ranveer Singh and Alia Bhatt, are currently in Germany along with director Zoya Akhtar and producer Ritesh Sidhwani for the world premiere of the film at the 69th Berlin International Film Festival (Berlinale). 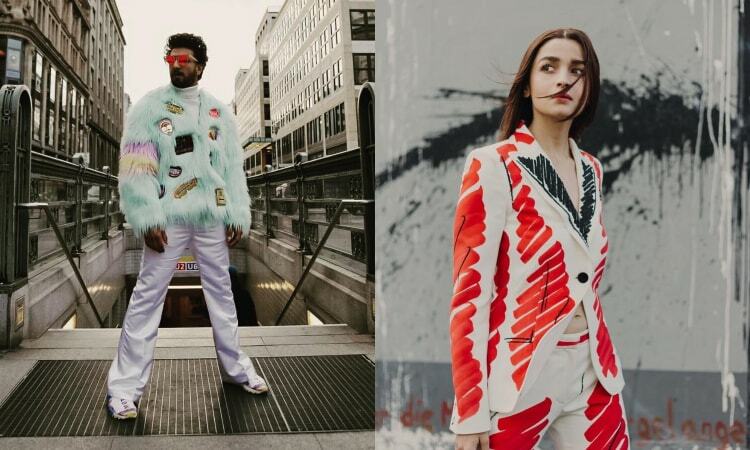 And we must say, both Ranveer and Alia are leaving no stone unturned to impress us with their sartorial style. During a recent press interaction, Ranveer took his fashion game a notch higher by opting for a customised fur jacket by ace designer Manish Arora. He paired with look with shimmery white pants, white high-neck tee and pink sunnies. Not to forget, his jacket had words Gully Boy written on his sleeves. While his quirky and outlandish outfit received mixed response from the netizens, the inspiration behind the outfit will certainly win your heart. Commenting on how the outfit came through, Manish wrote in his social media post that it is inspired by his own days of struggle. He added, "The jacket symbolises freedom, a reminder that we are rare and our own heroes." Alia, on the other hand, was seen dressed in a white pantsuit from Moschino with black and red lines all over it. She paired it up with a pair of white heels and her hair was left loose. Gully Boy is slated to hit the silver screens on February 14, 2019.